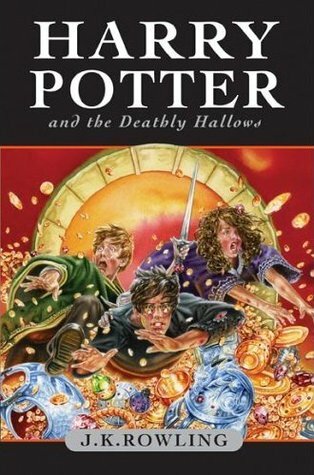 The long summer has dragged on, and despite experiencing a terrible and traumatic event with the death of Cedric and the resurrection of Lord Voldemort at the end of his fourth year, Harry is left horribly isolated with his aunt and uncle at Little Whinging. 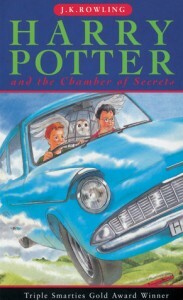 None of his friends or teachers contacts him or offers him any information about what might be going on in the wizarding world, so it’s not entirely unexpected that Harry, probably suffering from Post-traumatic stress, is incredibly moody and upset at everything in the first half of this book. To top it all off, not only is the Daily Prophet printing articles calling Harry (and Professor Dumbledore) unhinged and mentally unstable, but the Ministry sends Dolores Umbridge to oversee education at Hogwarts. 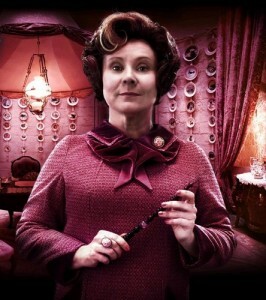 Ah yes, Dolores Umbridge. Here is a woman who, despite not being a follower of You-Know-Who, still does an excellent impression of a dark witch – punishing students in horrible and unconventional ways, taking away privileges and has the most outspoken prejudices against “half-breeds” of any villain in the series so far. As she steadfastly refuses to believe that Voldemort has returned and that the fifth-years need to know anything about Defence Against the Dark Arts, the students start up their own group called “Dumbledore’s Army”, taught by Harry himself. 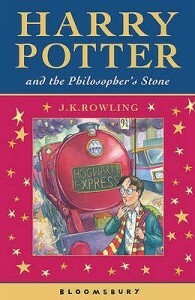 This gives them a release from the stresses of their school life and gives readers a great opportunity to see more of characters such as Neville and Luna, who are often pushed aside when the action starts. Even Ginny gets more page-time in this book, even if she does spend most of it with Dean Thomas. The fifteen-year old students are starting to pair up and Harry finally gets together with Cho Chang, his crush of the past couple of years. It’s such an awkward relationship – Cho is clearly rather depressed about the events of the previous year, and Harry has no clue as to how to comfort her. Being in different houses, they hardly ever get to see each other, so it’s really only a matter of time and an extremely awkward Valentine’s Day lunch to break them up again. Ron and Hermione are still delightfully bickering with each other at every opportunity, but I’m not sure even Harry has realised at this stage just how much these two care for each other. 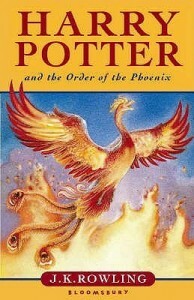 In my review for the Goblet of Fire I wrote that things start to take a dark turn from this book. While this book is certainly dark at times, it is a surprisingly normal school year. The fifth-years do their mountains of assignment work and take their OWL exams with only a few disruptions. Not sure what I was remembering from previous reads – perhaps the memory of Professor Umbridge overpowered everything else! 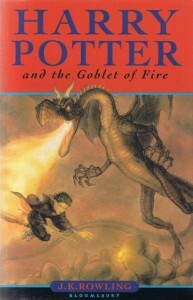 The confrontation in the Ministry of Magic is a little confusing with all the rooms, objects and injuries involved but it of course leaves Harry with a fresh grief by taking away the father figure he only recently discovered. 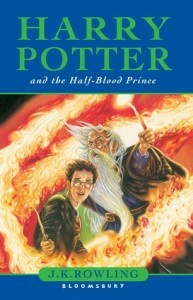 I always felt Sirius got a bit of a raw deal in the overall story. 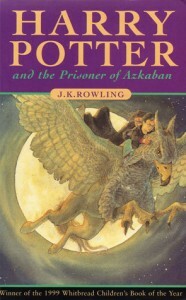 He’s barely in any of the action and has to stay at Grimmauld Place – a house containing painful childhood memories for him – almost the entire time, then is unceremoniously dumped out of the story again. At least at the end of The Order of the Phoenix the wizarding world is left with undeniable proof that Voldemort is back and on the loose. What they choose to do about it remains to be seen. While I really enjoyed re-reading this instalment and seeing all the details left out of the film, I feel this wasn’t the most enjoyable of the stories. The poor kids are swamped with work the entire time and there’s barely any room for the fun that has permeated the previous stories.